NDC Sensors – On-Line and At-Line Gauges for the Measurement of key constituents in Foods, Chemicals & Minerals, Building Materials, Pharmaceuticals, Tobacco and Paper & Converting. The company is certified in accordance with ISO 9001:2000 NDC has been supplying industry with gauging, measurement and control systems for over 35 years, helping our customers to achieve process efficiency and product quality improvements and, in turn, to retain their customers’ long-term loyalty. NDC products are designed to provide market-leading performance with lowest possible ownership costs and maximum reliability throughout their operating life. During this period, many things can change as your company introduces new products, adapts to new market conditions and gears up to meet the challenges which today’s manufacturing environment presents. To help meet this challenge, NDC Infrared Engineering offers a dedicated team of technicians and support professionals to serve the customers needs. 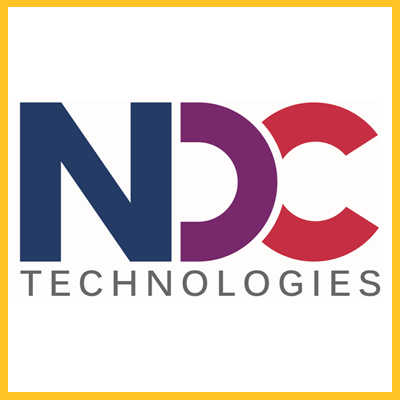 Whether your purchase has been an on-line scanning system, an NIR on-line gauge, or an at-line analyzer, NDC is committed to providing outstanding service to the customer; in short, to be your “Measure of Quality TM. The InfraLab e-Series At-Line Foods Analyzer delivers rapid, accurate moisture, fat and protein measurements with minimal sample preparation and no special user skills. Ethernet enabled, it can be incorporated into LIMS and other management information systems. The FG and TFG710S Thickness Sensors range provides highly accurate thickness measurements of extruded and cast film and sheet products, both single and multi-layer – with the ability to measure up to three components simultaneously. New for 2010 is the ability to measure the true thickness of voided films. For the Further Processing of Meat products, fat analysis is a vital parameter, for quality and batch process control. the InfraLab Meat Analyzer is fast with a multi-component measurement of fat+moisture+protein taking just 10 seconds, saving you time and money in your process. The MM710e On-Line Food Moisture Gauge can also be used for the measurement of fat and protein in a wide range of food products, such assnacks, dairy powders, coffee, chocolate and other food applications. Lithium Ion Battery Manufacturers can measure, monitor and improve production performance using NDC’s on-line thickness measurement systems for micro-porous separator films as well as coatings. In addition, the Series 710e Gauges benefit from a range of peripheral devices and multi-lingual interfaces to deliver their critical process measurement information to the right place and in the right format. • Performance – stability, reproducibility and accuracy are to laboratory standards. • Ease of Use – no special operator skills are required. • Speed – results are available in around 10 seconds. • Robustness – designed for repeated long-term use in a production environment. 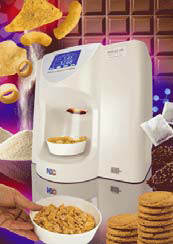 • InfraLab e-Series Food Analyzers – a family of single and multi-component moisture, fat and protein analyzers for powders, flakes and granules in a wide variety of applications in Foods Processing. 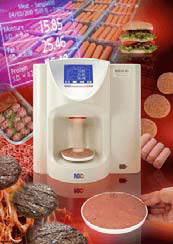 • InfraLab e-Series Meat Analyzers – single and multicomponent fat, moisture and protein analyzers for meat (beef, pork, lamb, poultry) for at-line analysis in Meat Further Processing and more. • InfraLab e-Series Tobacco Analyzers – a single or multi-component moisture, nicotine and sugars analyzer for GLT and Primary processing. • Moistrex MX8000 At-Line Paper Moisture Analyzer – a bench-top paper moisture analyzer for applications in paper making and converting. 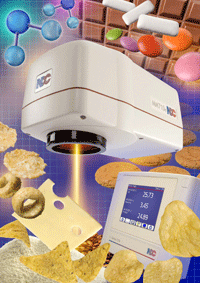 The InfraLab e-Series At-Line Foods Analyzer from NDC provides rapid accurate measurement of moisture, fat and protein in single or multiple component configurations in a variety of Food Products. Easy-to-use, the Infra- Lab requires no special operator skills, and takes just 5 seconds to make the analysis. 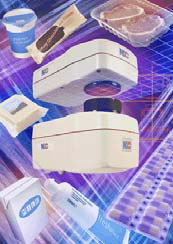 Using multi-wavelength NIR reflection, the InfraLab does not require contact with the product sample. The sample dish is placed on the turntable; the InfraLab automatically recognizes that it has been placed there and begins the analysis.